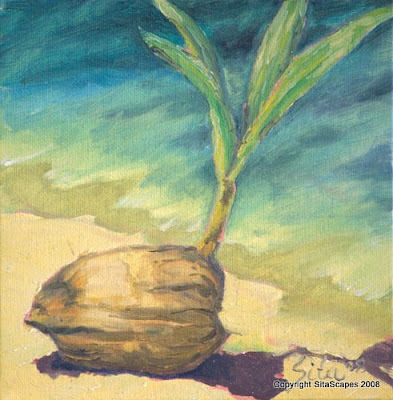 Artists Comments: While my sister was visiting from Seattle, we decided to purchase two baby coconut trees from KMART. Her one stayed sealed in its A.G. bag for the journey home to Seattle while mine became our official vacation mascot. Nutty Buddy went everywhere with us; to the surprise of many passer-bys. Today, I created my first portrait in my career of Nutty Buddy near the shoreline.